It is a toss up between Premium Rush and Quicksilver. I just watched the Flying Scotsman. Not a bad way to kill a little time in the off season when the weather is crappy (otherwise I'd rather be cycling). It was a good movie. About a cyclist (Obree)... and his life and cycling accomplishments (family, friends, and inner demons). I can't believe the movie and the book have the same title. I have the movie and watched it like two billion times. Now after reading the book which is written by Graeme Obree. I have a hard time watching the movie. Nothing even matches up with the book besides there's a guy named Graeme who rides a bike made by himself and breaks the hour record. Besides that the director must of been just the given the cliff notes and only read the cover page. Barely anything matches up and Malky doesn't even exist in the book. Cripes he's one of the main people in the movie. I realize a lot of movies deviate from the books but this one is beyond that. It's like two completely different stories. I'm surprised nobody said "Klunkerz". I also like "Rising from the Ashes". Oh man, absolutely agree. 3rd saddest movie I ever watched. Right behind Lilya 4ever and Elephant Man. Also, a great movie. Also, I would recommend you Umberto D. movie which is from same director and also deals with similar issues like poverty etc... in post war Italy. Sounds typical for book to film. In Starship Troopers Johnny Rico is Filipino. It is a major point of the book. He is a blond haired blue eyed Aryan in the film. In the book his father is alive and his first Sgt once Johnny makes Lt. His Friend Carl is dead. In the Film Carl is a major character at the end and Johnny's father is dead. And he is never more than a grunt. Come to think of it the change in attitude of his father and their reconciliation is also a major part of the book. In 'The Last of the Mohicans' in the book Hawkeye and Chingachgook are about the same age, having gone on hte warpath together the very first time together in "The Deerslayer". In the Film Chingachgook refers to Hawkeye as his white son. In the film Hawkeye's sedition is a major factor. It never happens in the book, nor does his romance. And best of all in the films portray Alice as a shrinking violet a fascination to Uncas for that reason, and in the first film as blonder than blond. In the Book she is half black and very self sufficient, which Uncas values. Oh and in the film General Munro is killed. In the book and in real life he is not. That is a bit unusual, films defying both the book they are based on and history! Bicycle Thieves. For sure. Also The Flying Scotsman and Klunkers -- but I draw the line at fiction/non-fiction. No love for The Triplets of Belleville? - Better Off Dead: "I want my two dollars!" I know next to nothing. I am frequently wrong. Last edited by mconlonx; 02-10-15 at 04:04 PM. There used to be a bike tv show called Bicycle Journal. One episode went on Ciclismo Classico's Bike Across Italy trip. Several years later, I did that trip. Anyone seen The Way Bobby Sees It? 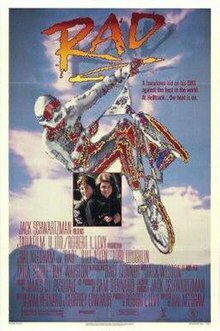 It's a documentary about Bobby McMullen who rides mountain bikes professionally... and he's blind (among other things). I went to a local filming of this movie and Bobby spoke and answered questions after the movie. Dude is a huge inspiration... if not crazy insane. I believe he currently rides for Santa Cruz. "Ride To Glory" is a hilarious French movie about a man who decides to ride every stage of the Tour a day ahead of the pros. The French title is "La Grande Boucle". It's subtitled. I found it on Canada netflix . Breaking Away is my #2 choice. bicycle dreams is good one. Breaking Away, Quicksilver, and American Flyers. Plus, I've been to the Little 500 race several times on the Indiana University Campus and cheered the Cutters Team on. I didn't realize there were that many movies with bike related themes. I saw American Flyers only once in the 80s. But since I found it on DVD about a year ago I've watched it about 10 times. I like the story,80s movie music,race references, and overall cheesy stuff. Something about the opening scene reminds me when I felt stronger and riding was just for fun and not a way to help keep me healthy. Quicksilver.., but I want to see American Flyers. So did I. Actually Premium Rush is a pretty darn good movie with a lot of great cycling..... as well as fine acting, complex story line, excellent cinema photography, and special effects. I just purchased Ride the Divide after watching on Netflix. Love the music as well as the story. I agree with @Dave Cutter above on Breaking Away being a favorite. Also saw the Flying Scotsman and liked that a lot as well. Recently saw Line of Sight on Netflix. Its about bike messenger races in a few different cities. Amazing that those guys don't get hit by cars/trucks. Was actually cringing on some of the NYC scenes of them dodging cars and pedestrians. And I ride in NYC every day. "During the height of the Vietnam War in 1969, Charlie is on his way to Michigan Tech University, and Derek is counting the days to his inevitable military draft eligibility. Before their futures take hold, the lifelong best friends embark on one final adventure: a 1300 mile bike ride along the shores of the gargantuan Lake Superior. With two-speed Schwinn bicycles and limited preparation, Charlie and Derek pedal through the massive northern backwoods of Michigan, Minnesota, and Canada. Along the way they face hunger, exhaustion, and the kind of people in the world who never wanted to be found." Just watched A Most Wanted Man. The Triplets of Belleville (2003), and Breaking Away. I watched "Murder of Couriers" on Amazon Prime last night. Documentary about Vancouver, BC, Canada bike couriers. without a Motor but with motivation..
Last edited by fietsbob; 11-05-16 at 12:51 PM.